Aghios Gordiosis a large bay placed north west of the Corfu town. The village is small and is developed between the beach and the mountain behind and is a great place for tourism. Here there are many buildings like big hotels, apartments, tourist rooms and shops. Arriving here from the main road you will have a real nice view of the entire bay. Very nice is also the small island Ortholiti that is at an end of the beach. The beach of Aghios Gordios is very long and runs along the entire gulf. It has a marvellous soft sand and offers many tourist activities. This beach is perfect if you don’t like a very deep sea and it is surrounded by the beautiful Mediterranean nature. Ortholiti is a large rock in the middle of the sea in front of the southern part of the bay. 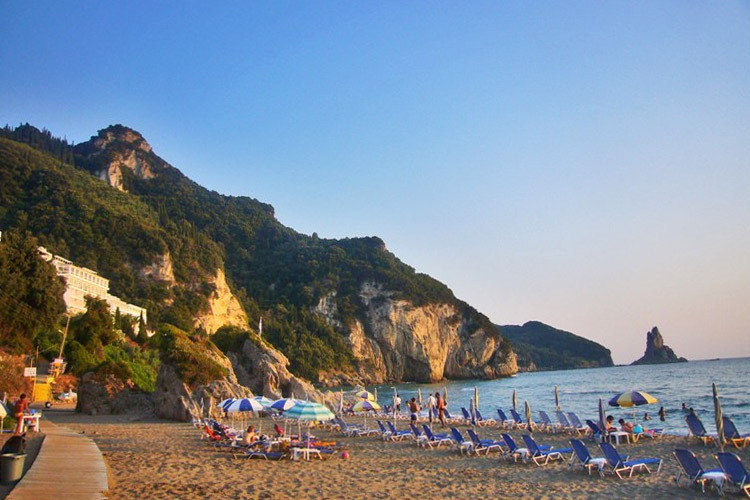 Aghios Gordios is one of the largest bay along the west coast of Corfu island and you can reach this place by public bus service. Here you can moreover organise boat tours to discover other beaches along this coast. In Aghios Gordios there are some restaurants near the beach where you can stop for a break and few tourist shops where you can buy a souvenir from Corfu. In this village you can find few places to enjoy your night. Here there are some restaurants where you can have dinner while watching the sunset. During the day you can practice several activities on the beach. Big hotels complex, private apartments and studios are placed just in front of the sea and in the area where the mountains begin.